You may have noticed we did a major design overhaul of Copyblogger a few weeks ago. If you haven’t stopped by the site lately, come on over and take a look. In keeping with tradition, I like to release a free version of the previous design whenever things change substantially. So that’s exactly what we’re doing now. So, I’d like to introduce the Copyblogger child theme for the Genesis Framework for WordPress. It’s a robust, flexible, and multi-colored interpretation of our previous design, and it’s yours at no charge. As a Genesis child theme, you’ll need the Genesis Framework for WordPress to use the Copyblogger design. If you already own Genesis, you’re ready to download the Copyblogger child theme here. If you don’t own Genesis yet, you can pick it up here for an incredibly reasonable price. This will also open you up to the entire line of StudioPress designs for Genesis, plus a growing number of third-party child themes and custom designs. I will download this right away and get started with it! If restoring my old design will bring the old signup rate back, I just might do it. I have WordPress site that also includes vBulletin forums and a phpmydirectory service directory. I have copied some the styles from my current WP theme into the templates for these non-wordpress parts of the site, so I have consistent styles, headers, menus, etc. I’m interested in a Genesis Framework and the Copyblogger theme, but will I be able to copy some of the theme styles and elements to the non-wordpress areas of my site? Andrew – as a person who is a huge vBulletin fan and we currently use it on StudioPress, I’d like to suggest looking into using bbPress. They’ve recently released version 2.0 which is very stable, and integrates seamlessly with our themes. Thanks for the tip about bbPress. I’d love to have a forum that integrates better with WordPress and I’m not tied to vBulletin, but I would want to import my members and all past discussions into any new forums. I had a quick look at the bbPress site and forums, and didn’t see any mention of this. So that would probably be a deal breaker. Yeah, I don’t think they have any import tools right now. Maybe one day a plugin gets developed which can somehow do this. So are there any reasons why I couldn’t copy the header and styles from the Genesis Framework and the Copyblogger theme to vB the same way I did with my current theme? I’m not really sure what the Genesis Framework does or if that causes the themes function differently then regular themes. Yes you should be able to do that – assuming you know how to hack/customize vBulletin skins. That’s pretty much what I did when I customized the StudioPress forums on vB. It’s pretty simple to customize colors – check the bottom of the style.css to see the few lines of code that are required. If you run into any issues, let me know and I’ll lend you a hand. Seeing Copyblogger in blue feels wrong… but looks oh so right. Well done guys, as always! Thanks for sharing this theme for free. Would be great enough of you if you let me know how to show related posts and social icons after post – just like copyblogger site? There are a lot of great free plugins that can add those two elements for you. Thanks, will find it and use it on my blog..
I’m spoil of choice now, Just brought Genesis Framework + Lifestyle theme + Free updated Child. Now i can have copyblogger theme (Legally) , This puts me in to serious trouble as i only have one website to try one. Anyway, thank for sharing. Wow ! This is absolutely wonderful. Thanks for making it free. Wow – what a great freebie! My site has been needing a redesign, and the copyblogger theme is a great starting point. Thanks Brian! Thanks for the theme. Have thesis and gladly paid for it, but I can use this on other sites as well. You do need Genesis to run this theme, but it’s really inexpensive if you don’t have it yet. I decided to redo my whole website with StudioPress and Genesis Theme. Honestly, couldn’t be happier. Very amazing user-friendly dashboard, beautiful layout, versatile options and unlimited customization features. The SEO part of the theme is just incredible. It just goes to show you the difference between a free basic theme to a paid professional theme. I have been reading and researching about the most popular frameworks for days for starting my new website. And now, I have decided to go with Genesis. Hope I love it too, as much as the others who recommended it to me. What really convinced me is the number of fantastic reviews, comments and articles on Genesis. BTW, I have a few questions to ask if you can help! 1. Is it possible to add features like sharing options on each post and the homepage like. StumbleUpon, Twitter, Facebook, Digg, Reddit, Delicious etc. for the Copyblogger’s free theme. How easy will it be, coz I am not a designer neither a coder. 2. If the genesis or WP gets an update will this free theme will also be updated to support the latest versions? 3. Can we make changes to the design of this free child theme. 1) Yes, there are many social sharing plugins that are available on the WordPress.org repository. 2) The Genesis Framework is always updated (as necessary) to work with new features that WordPress has put into their updates. The child theme is merely cosmetic (design – CSS and images) so there wouldn’t be a need to update that. 3) Yes, that’s exactly what a child theme is designed to do. House any visual customizations (fonts, colors, etc) for the way the site is displayed. Is there a way to add a custom logo to the header? I’ve already selected the option to use an image logo at Genesis Settings, but the logo does not appear. Glad for any help. Hi Brian, dont you think the 960 px width will be too wide if I want to use the Header High Widget Area. a generous contribution here, thanks mate. I just have to convince our web coder to install genesis and use the theme. This is probably a dumb question but is there a way to install the Copyblogger theme and just try it out without blowing out all of my widget settings? I made that mistake a while back when I changed the child theme of an existing site then when back to the original theme I had… all of the sidebar info was gone and all of the plugins were reset. Jay – the best way to do that is to move all of the widgets you have to the Inactive Widgets section on the Widgets page. This way you can see what things look like with the new theme, and then you can move them back if you switch back. As far as I know the header right, primary sidebar, secondary sidebar widgets shouldn’t go anywhere if you switch themes since those are Genesis specific ones. Thanks, this is great as usual, I think I might borrow this permanently. Thanks again. Can we still see the old theme somewhere, or at least some better screen shots? I was an occasional visitor to the site, but I don’t really remember what the old theme looked like or what features it offered. Never mind. I just found the link above to the demo of the old theme. Is there a way to translate the theme into a different language? I want to translate the theme into the language of my readers (Romanian). How can I do this? Thank you so much for releasing this as a free theme. I’ve installed it and love it! Is there a forum for Genesis and/or this free theme? I’ve got a couple of things I would like to try out with this theme but after spending the past couple of days researching ways to do it, I’ve come up empty. Thanks, again, for this great theme!! Love it!! I am regular reader of Copyblogger. I mainly love the simple and cool look of this blog. Thanks for share. I modded this and using it on my blog now. Thanks! Thank you sir for this awesome theme. I’m gonna use it after i alter Single.php file. Nice Theme and great layout. Please how to I add a custom image logo instead of the dynamic text. I was able to add a logo by editing the css style sheet of the child theme. From the wordpress dashboard click on appearance, then editor. by default the sytlesheet is selected. In this example I am using the blue color scheme for my website. I’m not 100% sure is this is the best way, but it worked for me. Thanks for this info, Joe. I’ve been trying to do this with another Genesis child theme and this may just work for that theme. This is a great theme I love it. Only problem I’m having is trying to add comment section on a page. How would I do that? Currently there is no comment section on any of the pages I created. 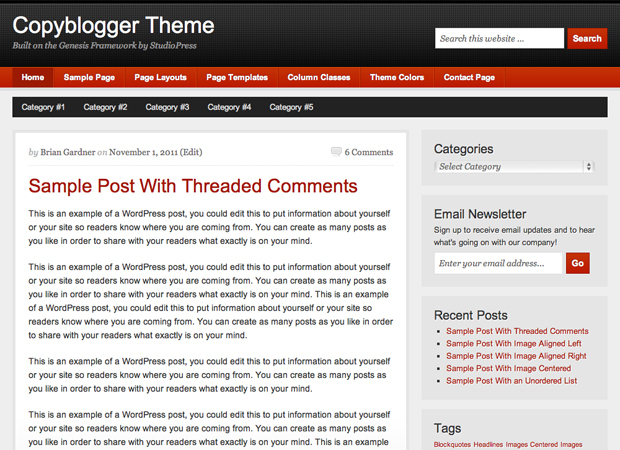 Just installed the copyblogger child theme on my blog. How do I make it so the tags do not show up in the post on the home page? If someone could let me know how to do that that would be most helpful!